Warning: This game contains scenes with flashes. Player discretion advised. Damon and the Five Keys is a fan-game based on the webcomic Zenchav by Draco Plato. In the game, you play as the half-human, half-jinn character Damon. After receiving orders to eliminate a traitor from Rex, leader of the Demon Council and Damon’s father, Damon’s search takes him to a small town. 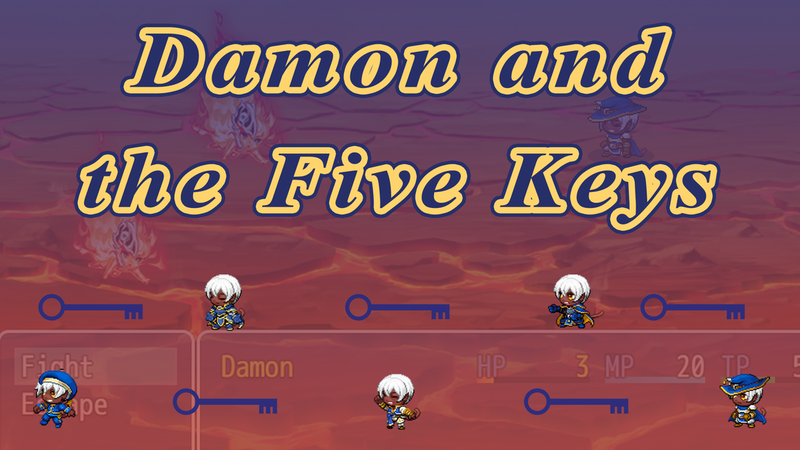 With some intel from the Earth, Damon must seek out five keys in order to fulfill his objective. The game was made in the short span of a few weeks. This is notably the developer’s first attempt at utilizing turn-based combat related mechanics. -Travel through five different areas searching for the keys and becoming stronger. -Find equipment upgrades in each area to be ready for each new encounter. -Fight an exciting boss battle and emerge victorious! Bugs? Send bug reports to rebelvampiresay@gmail.com. Please include a description of where you are in the game and the exact nature of your problem.